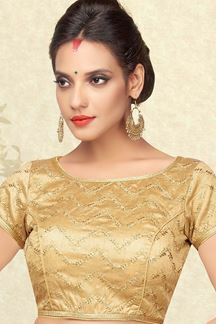 Dignify your existence wearing this glorious gold designer brocade blouse featuring self designs all over and gold zari border along the edges in a shiny end. Don with a sheer black chiffon saree with gold border for an exquisite glow! Note: Color may slightly vary due to digital photography.